Once upon a time huge sloops and, later, steamships navigated tidal waters which carried them from the mouth of the New York Harbor all the way up to Albany. These ships were buffeted upriver or sucked back downriver by an Atlantic tidal current so fierce it could lay waste to a river-going vessel. Whether ferrying cargo and people up to Albany or down to Manhattan, and sometimes on to Europe, river traffic took advantage of the current as it transported goods and people. River towns with natural harbors became regional market centers, economic drivers and creators of wealth. 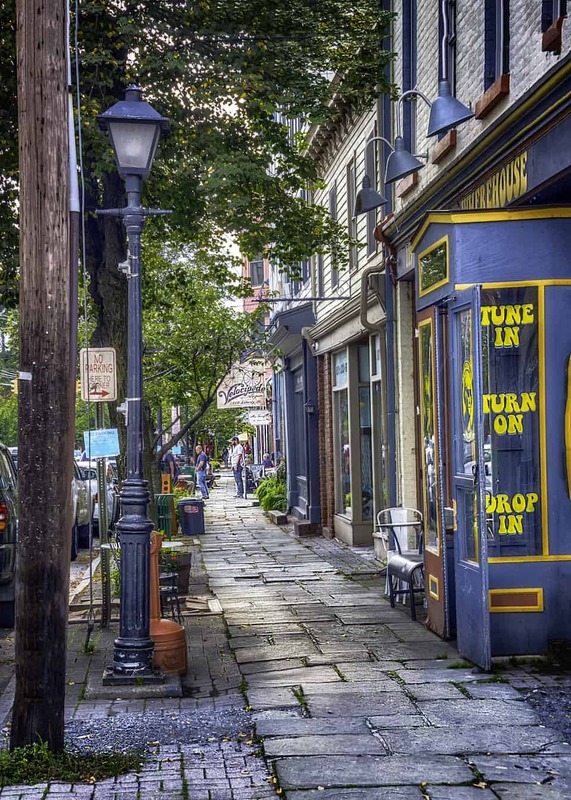 In present-day times, Newburgh, N.Y. has a historic district recognized as one of New York State’s most significant and this is because historically Newburgh was a huge market center where economy flourished, and people built homes and businesses and lives. Through three centuries Newburgh enjoyed not just economic boom times but also a distinct architectural narrative qualifying her for recognition as having, outside of New York City, the state’s largest historic district. 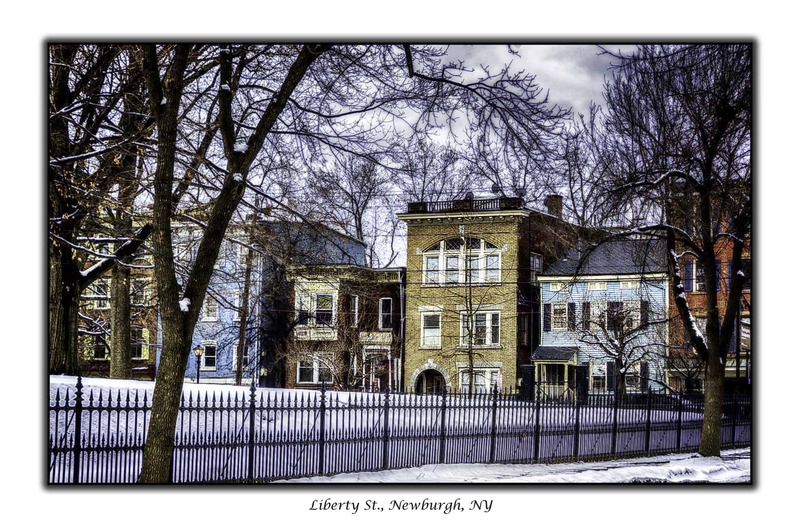 In fact, Newburgh has two distinct historic districts, the East End Historic District and the Montgomery-Grand-Liberty Streets Historic District. However, these two districts are considered by the State to be one continuous historic district, and for the purpose of this blog post, we will treat them both that way as well. The districts appropriately front the Hudson River and run within a defined area inside of the larger city to points east, west and north and south in the city. Broadway serves as a sort of line of demarcation, with many of the properties south of Broadway, near Washington’s Headquarters, the oldest in the city. Other properties in that district, such as the properties in Washington Heights are later 19th and turn of the 20th century Victorians, or Italianate row houses, popular in the late 1800s with middle and working-class families. The historic district south of Broadway also includes the aforementioned Washington’s Headquarters State Historic Site, as a National Historic Landmark. The boundary of this District runs below Broadway from Robinson Avenue (US 9W) to the west, Water Street (directly on the Hudson) and Bay View Terrace on the east; Monument and Renwick streets to the south and LeRoy Place and Broadway to the north. The boundaries of Montgomery–Grand–Liberty Streets historic district are defined by its three named north-south streets in the northeast quadrant of the city and includes 250 buildings within its 1,010 acres. Importantly, because properties in the defined East End Historic District have a historic designation, they are entitled to New York State historic homeownership rehabilitation credit, and this has proved attractive, drawing homebuyers interested in historic property in a city that is enjoying a renaissance. The Dutch settled the Hudson Valley with a journey that began as schoolchildren are commonly taught with Henry Hudson’s famous voyage up the river on behalf of the Dutch crown, on a search for a passage to Asia via the New World. While exploring, Henry Hudson claimed what we now know as Albany for the Dutch in 1609. During Dutch control, Albany was known as Fort Orange and was a major trading post especially for the fur trade with native Americans. Eventually, the English took control and renamed it Albany, much as they renamed New Amsterdam, New York. The city we know of today as Newburgh was not, however, a Dutch settlement. Newburgh was settled in the winter of 1708-09 when a group of fifty-four Germans from the Rhine Valley traveled here. Specifically they came from a war weary area known as The Palatine a site caught in the crossfire between religious and financial interests od various groups in and out of power. The “Palatines,” as they were known henceforth, appealed to the British Crown for help because as they starved in their impoverished lands, further, a mini ice age had set in. Life was rutal. Britain, led by Queen Ann, took pity and saw opportunity and so financed the group and sent the entourage to the New World. They were viewed as useful in establishing a settlement in New York in order to create a naval store, and also to serve as a guard against potentially hostile French and Indian forces to the north and they came to the New World to carve out an existence. They were given a land grant defined as a “patent,” which effectively was a partnership with the crown. They moved to the area in Newburgh near the Quassaic Creek and built their lives, but not without great hardship as can be imagined. Naval stores processed products essential to the maintenance of wooden sailing ships: tar, pitch, turpentine, and rosin. Over time other immigrants joined the Palatine Germans, in the area we now call Newburgh. The newer arrivals were often of Scotch Irish stock, fleeing their own difficulties at the Ulster Plantation in Ireland. Obviously a much later ferry, but this service took its cue from Alexander Colden’s 1742 ferry from Newburgh! Eventually, the Palatines were outnumbered and their influence diminished. In 1743, an “official” ferry was established when Alexander Colden, son of Cadwallader Colden (an important NY Governor who owned a large tract of land in Montgomery, N.Y.) petitioned Governor George Clarke for water rights in order to operate a ferry from Newburgh across the river to Beacon. Later, Alexander Colden’s shrewd vision of an east-west ferry was seized upon by Washington’s senior military strategists during the later American Revolution when it kept commerce and communication between patriots in New England and the Continental Congress in Philadelphia open. It wasn’t long after Colden’s Ferry was launched that Newburgh established herself as a vital part of river trade and economy attached to both Albany and New York City, and points east and west. Shipbuilders and shipping transport companies trading lumber and grains and dry goods (as well as other ancillary businesses that attach to large endeavors) began to give rise to the Newburgh waterfront. Newburgh became ever more crucial during the war, as it’s riverfront became a logistics focal point with docks and storage and the ferry. By 1777 the city was humming not only with military activity but also with the people who fled New York City after the English took over there. By 1782 the War for Independence from England had effectively been won with a victory in Yorktown. Washington, headquartered at the Jonathan Hasbrouck house, was holding the frail colonies together. Impoverished soldiers who had left their homes and worked without pay for years were at their wits end and in a mind to rebel against Washington, obliterating all that had been gained and threatening the infant country’s future. “He seemed to be having little effect until he retrieved a pair of spectacles from his pocket to read a letter from Virginia congressman Joseph Jones. Jones had recently written to Washington of the huge fiscal problems Congress had to solve before they could justly discharge the claims of the army. The officers were surprised to see Washington momentarily fumble with spectacles he had received only the month before. None of them had seen their general and hero in his eyeglasses, and he seemed to age before them. But his off-hand comment, made to put them at ease, confirmed again the personal character that had sustained the Revolution. The assembled officers were caught off guard emotionally… The stress, the majestic bearing of the commander-in-chief, his appeal to duty, and then the very human act of their 51-year-old leader now worn by years of war destroyed the cabal and quelled the incipient rebellion. Taken from an article on the Claremont Organization’s website. On November 25th, 1783 after several years of bloodshed and disruption, following the September signing of the Treaty of Paris, the war between Great Britain and the colonies officially ended, and an impressive transfer of power occurred. By 1835, Newburgh, N.Y. had become an important harbor town. Beautifully situated on a hilly decline on the east bank of the Hudson and about sixty miles north of Manhattan, by the mid-1830’s the burgh had grown to a population of 7683, according to a state census. Newburgh had catapulted to a new level of trading status in 1801 when a shrewd group of businessmen decided to create the Newburgh-Cochecton Turnpike Company. The turnpike company undertook the creation of a road connecting Newburgh’s docks on the Hudson River to points on the Delaware River. “Indeed, the turnpike carried thousands of settlers from New England to the western United States, many loading their covered wagons onto the old Newburgh ferry and crossing over the Hudson, then Western Avenue and the Cochecton Turnpike to head for Buffalo and the Ohio River valley.” Mary McTamaney, Historian, City of Newburgh. By then, Newburgh was a market center where considerable commerce was done, enriching a trading class of businessmen. Steamboats with names like The Washington, The Baltimore, and The Highlander were peripatetic transporters of butter, milk, grains, and other agricultural bounties most of which originated in Orange County arriving at the riverfront via the turnpike. Brickmakers pulled clay from the surrounding hills and produced millions of bricks to be sent to Manhattan and elsewhere for the booming construction of row houses. Iron Foundries turned out castings and machinery also in service to the growing metropolis to the south. Thirsty? The conveniently named John Beveridge Brewing company employed the latest in steam technology to turn out more than 20,000 barrels of delicious beer yearly, also relying on the huge agricultural production capacity of Orange County. Imagine how busy the streets were with horse-drawn carriages and working men rolling barrels of brew down to the docks! Consider also how one economy begets another. All that beer had to go into barrels, and that meant barrel making was needed, keep many employed. During a long portion of the 1800s, Orange County was one of the premium growers of barley, corn, hops, oats, rye, and buckwheat. Effective cultivation was made possible by changing technology which included reapers, threshers, and cultivators as well as an appreciation for improving the soil. Newburgh took shape in a post-revolutionary war economy during which, literally, captains of industry and the shipping merchant class, shaped both cities. Population growth at home, a food shortage in Europe, and the growth of farming in Orange County, N.Y. meant a ready crop of wheat and other foodstuffs was able to be shipped wherever necessary, to New York City and beyond. New England farmers and whalers and shipping magnates, seeking greater fortunes, headed to Newburgh. Like others before them, they recognized her position as strategic, given her port, emerging rail lines, and proximity to the fertile soil farmers (throughout what we now know as Orange and Ulster County) were using to grow wheat. Demands for baked goods and barley and rye for beverages of choice meant that there was never enough wheat. Newburgh catapulted to a new level of market trading status when in 1801 a group of businessmen decided to create the Newburgh-Cochecton Turnpike Company. Eventually, not very many years later completion of the Erie Canal would mean Newburgh’s role was somewhat diminished slowing economic progress. Growth was further slowed by the Erie Railroad which stole thunder from Newburgh’s river traffic, but by 1869 the West Shore railroad which ran north and south along the Hudson, along with the Newburgh and Wallkill Valley railroad running to the interior, restored Newburgh to a central place in 19th-century economic growth. 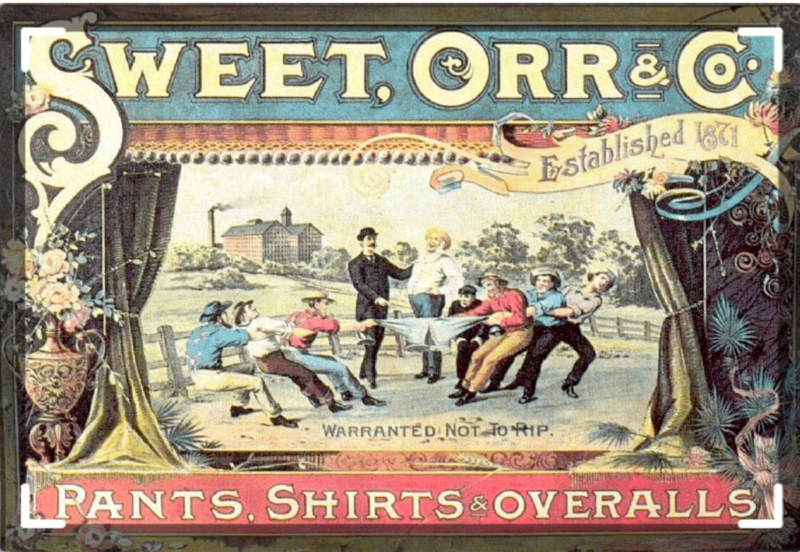 From the beginning to the end of the 19th Century, large manufacturing companies meeting the demands of the American middle and upper middle class were kept busy, as were their employees. There were soap companies, silk companies, fabric manufacturers, lawnmower manufacturers, and piano manufacturers. Each one adding to the economy and in the process creating a wealthy class of people. With this economic growth and prosperity in the early 19th century came a desire for cultural and intellectual awareness, and this happened on a national level. In Newburgh that manifested itself in the formation of a number of organizations, including The Newburgh Lyceum Association (1837) of which a young Andrew Jackson Downing was a founding member. Topics explored moral philosophy, industrial technology, science, and political philosophy. Interestingly, Newburgh’s Historical Society was also formed about this time, in 1845. To understand Newburgh’s significance as a historic district, which came to its apex in the 19th century, it is also useful to consider the development of the style of the young country. Few original Dutch Colonial architectural style buildings remain in Newburgh, however, the Jonathan Hasbrouck house is one. This is a classic stone house built in the Dutch style, with a steeply pitched roof. While it is true that Germans settled Newburgh, and French Huguenots settled in New Paltz and areas in between, the population within the 18th century Fort Orange Dutch colony assumed a distinctive Dutch style and this house reflects that. This building has its original fireplace, a jambless fireplace, typical of Hudson Valley Dutch Colonial architecture. In the Crawford house (home of Newburgh’s Historical Society) we see the orderly facades and symmetry favored by the Federal style. Buildings in the Federal Style are some of the earliest surviving architectural styles in Newburgh. 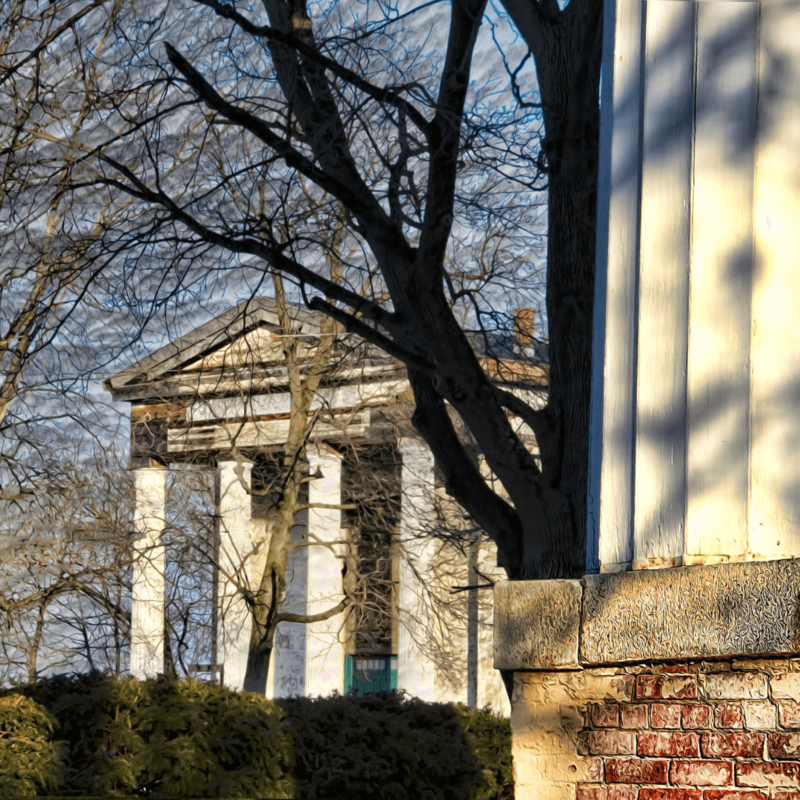 The young republic followed Thomas Jefferson’s lead in embracing classical ethical and structural principles for government and classical design principles for architecture. In the Crawford house (home of Newburgh’s Historical Society) we see the orderly facades and symmetry favored by the federal style. The ionic capitals on top of the porch columns indicate the Roman style typical of the Federal style. The ornate door has more of a Neoclassical feel. Located on Grand St, between Cambell and Second St., is St. George’s Episcopal Church, another superb example of Federal Style architecture. Its beautiful edifice was constructed in 1816. Stylistically, this building incorporates both the Federal style with Greek Revival, as it possesses architectural modifications by noted New York City architect Calvin Pollard, who designed its beautiful tower. Pollard also designed the Brooklyn Borough Hall, and the tower on that building if not identical to the tower he had designed and built for St. George’s, is quite similar. 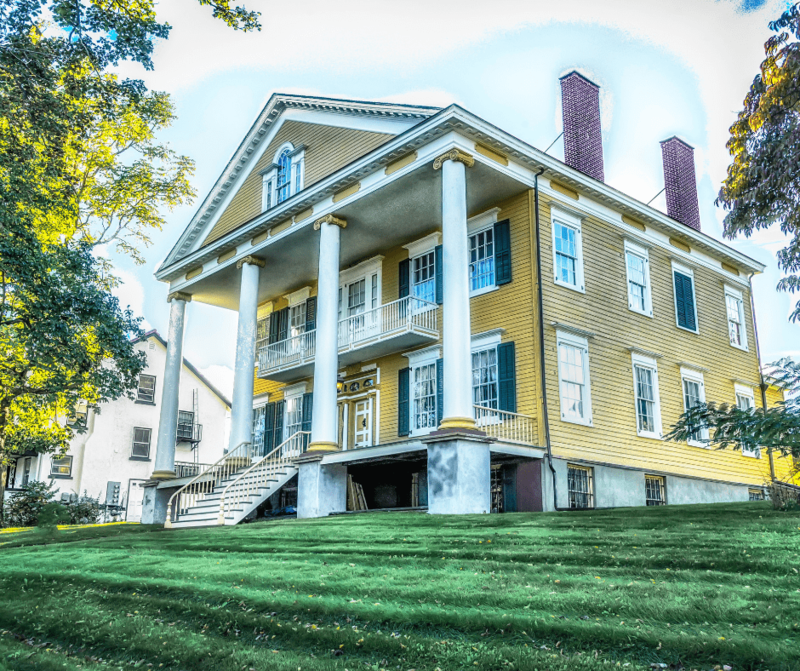 Pollard’s work in Newburgh represents two things: a well known and sophisticated architect who took a commission in Newburgh, where other notable architects would soon work, and the first introduction to the Greek Revival style of architecture Andrew Jackson Davis and Thornton Macness Niven would so expertly design, starting in 1835. More modest Federal style houses are located near Washington’s Headquarters (located on Liberty St., south of Broadway). The two side streets opposite the headquarters, Washington and East Parmenter street, boast many of the oldest homes in Newburgh. These homes are important not only for their design but because of the fact that these areas are where many of Newburgh’s African American families resided, for instance, Professor Dubois Alsdorf. These homes are far humbler structures than the Crawford house, but these row houses offer a good example of early 19th century Federal Style row house dwellings. The houses are located in the second largest designated historic site in New York State, and in the oldest neighborhood in Newburgh. The African Methodist Episcopal Zion Church (the present A.M.E. Zion Church was built on the same site and dates from the 1860s) is also on Washington Street adjacent to a few of these homes. In 1835 Newburgh took, if not the world, then the region by storm as it began building a number of significant Greek Revival buildings. First to be erected was the public building, the Dutch Reformed Church, designed by noted architect Andrew Jackson Davis, and built in part by, Thornton MacNess Niven, who was a stonecutter at the time (he later became a prominent, though unschooled, architect). Later, Davis and Niven would both work in New York. Andrew Jackson Davis would go on to have an incredibly productive relationship with Andrew Jackson Downing, but for a few years in the 1830s, it was Thornton MacNess Niven (Thornton Niven Wilder is a great-grandson) who would dominate the architectural scene. 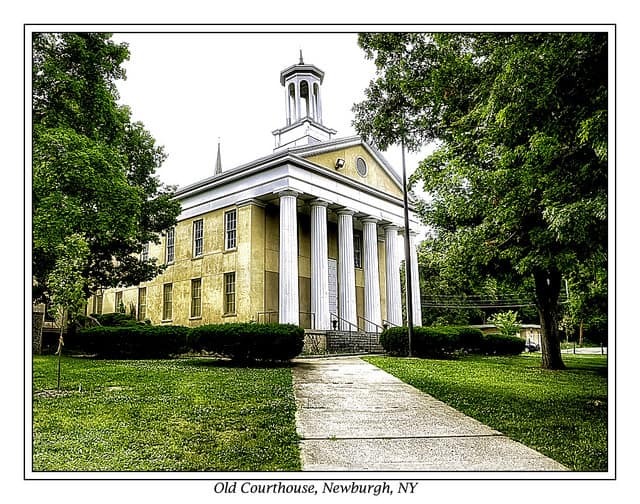 In addition to designing one of Newburgh’s most distinctly Greek Revival-style buildings, the former Orange County Courthouse on Grand Street, (1841-42), with its Doric-columned portico, Niven also, it is thought, designed and build “Quality Row,” (1836-37). Quality Row is a group of five frame row houses located on the north side of First Street, (1836-37). 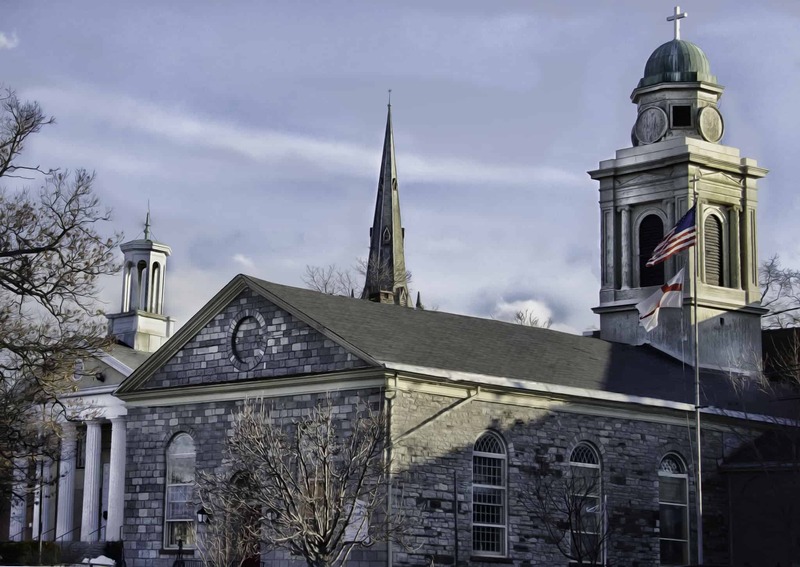 #112 First Street’s original owner was Reverand John Brown D.D., rector of St. George’s Church. The five homes are generally uniform featuring two and one-half stories, 3 bays, rear porches and a basement. The layout is rectangular with a left-of-center entrance and the roofs are low pitched metal gable. Niven’s stone masonry skills would be put to use later as he oversaw the construction of Dry DoCk #1 in the Brooklyn Navy Yard, one of the great feats of American engineering in the first half of the 19th century. Rural Gothic or Carpenter is characterized by pointed arches, pointed gables, projecting roofs and verge or bargeboards adorning the roof fanciful and highly decorative shapes. Other features include projecting bay windows, roofs that are steeply pitched, and large verandas embellished with scrollwork detail of quatrefoils, diamonds, and arches. The genre was defined in 1838 publication by Alexander Jackson Davis, Rural Residences and again in 1841 by Andrew Jackson Downing’s first book, A Treatise on the Theory and Practice of Landscape Gardening. In 1842 Downing collaborated with Davis on the book Cottage Residences, a highly influential pattern book of houses. The book did much to spread the so-called “Carpenter Gothic” and Hudson River Bracketed architectural styles among Victorian builders, both commercial and private. These defining features can be seen throughout Newburgh’s East End Historic District, in particular, Grand Street, Montgomery Street, and Liberty Street north of Broadway. Andrew Jackson Davis returned to Newburgh’s architectural scene after developing a working relationship with Andrew Jackson Downing, Newburgh son. Downing owned a nursery he had inherited from his father who passed away while Downing was quite young. The nursery emphasized fruit trees and other stock and as a purveryor, Downing had the opportunity to become acquainted with the elite of the Hudson Valley, owners of the great mansions overlooking the river. Downing was an intellectually curious young person who had a love of botany and horticulture, about which he wrote extensively. He became a tastemaker and an advisor to a rising upper middle class interested in science, nature, architecture, and philosophy via his magazine The Horticulturalist as well as books he wrote. Andrew Jackson Downing and Andrew Jackson Davis formed a partnership that was to change the focus on Greek Revival architecture and hasten in a new, American style. Their partnership was consequential in the evolving vernacular of American architecture in the 19th century. Davis was pursuing ideas in the Picturesque style when in 1838 he came in contact with Downing. 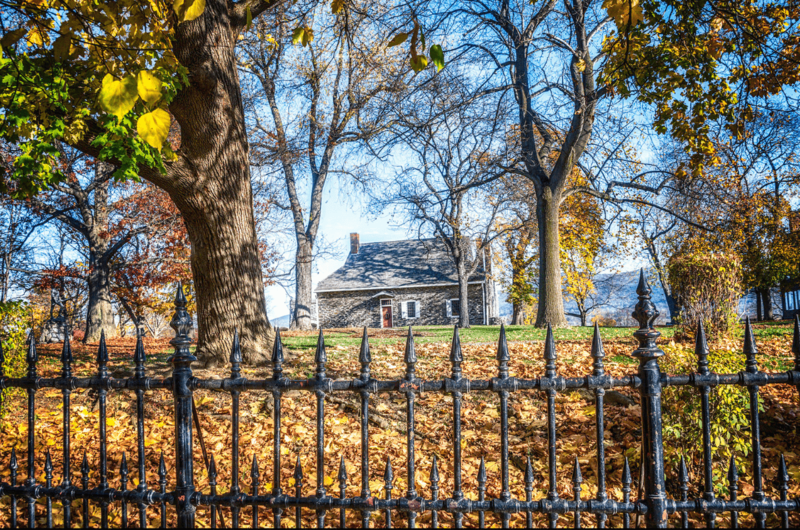 Over the next ten years, Davis and Downing popularized the Picturesque style receiving commissions for numerous Hudson Valley projects. Downing was not an architect, but he had ideas and theories about how Americans should live, and he liked a style of architecture popular in England. Davis served as an advisor and draftsman, and he received great promotion from Downing who touted him in publications. The genre was defined in 1838 publication by Alexander Jackson Davis, Rural Residences and in 1841 by Andrew Jackson Downing’s first book, A Treatise on the Theory and Practice of Landscape Gardening. In 1842 Downing collaborated with Davis on the book Cottage Residences a widely collected ans a highly influential pattern book of houses. It entered into many printings and helped spread the so-called “Carpenter Gothic” and Hudson River Bracketed architectural styles across the nation. These defining features can be seen throughout Newburgh. Eventually, Davis and Downing’s partnership faded, leaving Downing to find other architects with whom he could collaborate, as he was not a trained architect. Downing traveled to England where he met and recruited illustrator and architect Calvert Vaux, and (later) architect Frederick Withers, to join him at his Newburgh firm where they would help transform the harbor market city into a flourishing center of architectural activity. Other notable architects would follow these giants, including Frank Estabrook, designer of the Liberty Street School, in Newburgh, but while accomplished, none of these architects would enjoy the reach and impact that Davis, Downing, Vaux, Niven, and Withers would have across the entire country during the middle to late 19th century. 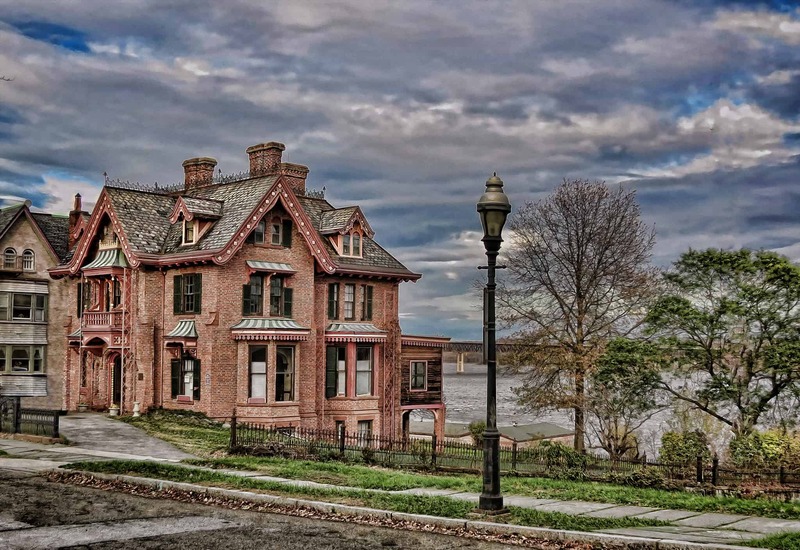 Their pioneering architectural work in Newburgh has set her apart and qualified her for the distinction of being able to boast of a grand historic district.